NASA's Insight lands on Mars – What's next? Home Uncategorized NASA’s Insight lands on Mars – What’s next? NASA’s Insight lands on Mars – What’s next? After a six-month space cruise, NASA’s latest Mars mission has landed in Mars with a single goal: explore its deep insides. 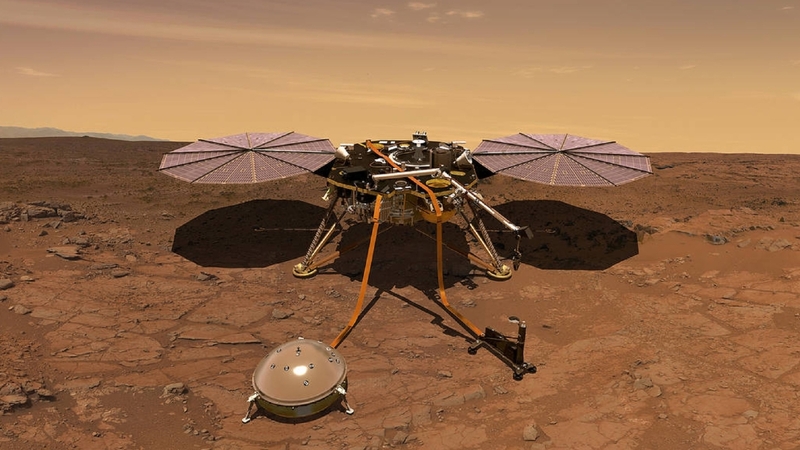 InSight Lander – the Interior Exploration using Seismic Investigations, Geodesy and Heat Transport – is the US space agency’s first craft dedicated to peer beneath Mars’ surface and study its interior. Here’s everything you need to know about the spacecraft, its landing and the information it has set out to gather. 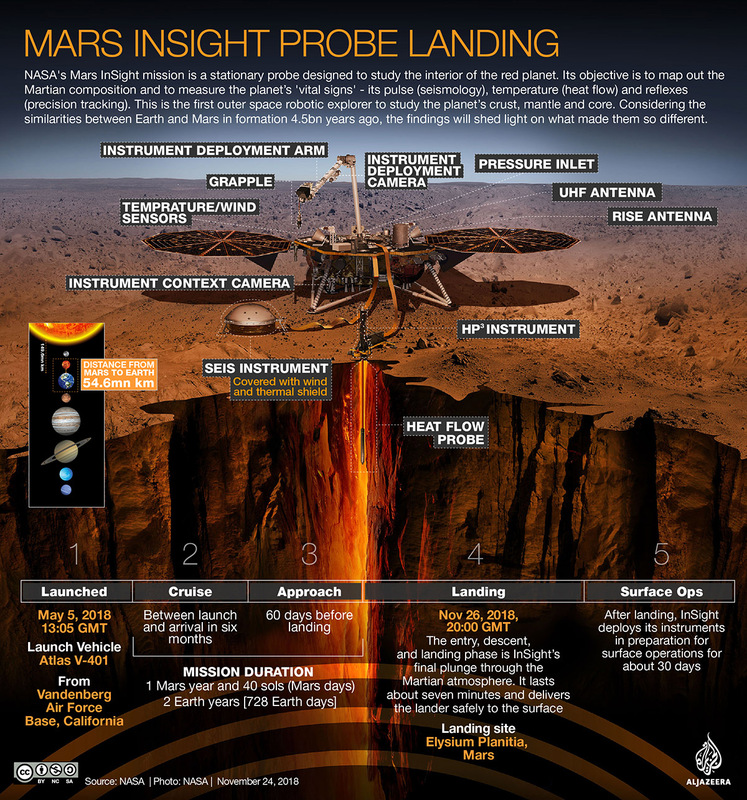 NASA describes the InSight Lander as the first outer space robotic explorer designed to give the billions-of-years-old Mars a “thorough checkup” by studying its crust, mantle and core. But there are big challenges before this is achieved – including the “seven minutes of terror”. In order to land, the spacecraft will enter the Martian atmosphere at supersonic speed (almost 17 times the speed of sound), then hit the brakes to achieve a soft landing on the planet’s red plains in a region called Elysium Planitia that has been chosen for its flatness. “As in all missions to Mars, the challenge is to get the module to operate its instruments and to land into the atmosphere correctly,” says Rafael Navarro-Gonzalez, a member of the Curiosity mission and a researcher at the Institute of Nuclear Sciences in the National Autonomous University of Mexico (UNAM). It can take up to about 20 minutes for the spacecraft’s signals to reach Earth, leaving mission planners waiting with bated breath to find out about if everything went according to plan. Unable to intervene, they rely on a perfect symphony of pre-programmed tasks, robotic devices and controlled explosions. “When using solar energy, it is important that the rover properly poses on the surface and that there are not big sandstorms that clog the solar panels,” Navarro-Gonzalez told Al Jazeera. NASA says the mission will measure what it describes as Mars’s “vital signs”: its pulse (seismology), temperature (heat flow) and reflexes (precision tracking). The lander’s main instruments include a seismometer to track quakes and a thermometer to measure the planet’s interior temperature by “drilling” itself five meters deep into the Martian surface. These instruments – provided respectively by the French and German space agencies – have a novel method of deployment: After landing, the craft will use a robotic arm to place them far enough from it to avoid any pollution of data gathered. Another instrument, a radio transmitter, will use the Doppler effect – an increase or decrease in the frequency of sound or light – to measure the “wobble” of the planet’s rotation axis. Jose Antonio Rodriguez Manfredi, a scientist at the InSight mission, told Al Jazeera that these instruments will allow NASA to record the planet’s “seismic activity, the movements of the crust caused by meteoric impacts, the heat flow and physical properties of the terrain and the variations that the planet may experience in its rotation period, daily, and in its translation around the sun”. What’s the goal behind gathering this information? However, three or four billion years ago, something changed, causing these “sibling” planets to take different paths. “The information collected will help us to understand the evolution of rocky planets inside and outside our solar system,” Navarro-Gonzalez says, adding that the gathered date will help open a window into understanding life. “Rocky planets like ours are essential for the emergence and evolution of life as we know it. “Our goal is to find a second genesis of life, and we believe that Mars is the [place] where we can find it. In this way, we could revolutionise the biology from terrestrial to universal,” Navarro-Gonzalez adds. Manfredi says this type of mission doesn’t only contribute to a greater knowledge of the universe and life but also results in improving people’s everyday lives here on Earth. “New materials and new technologies are constantly coming out of this type of projects which are later used in our daily life: mobile phones, the materials with which the bodies of cars or helmets are now built, medical advances that are tested in the Station International Space, among others,” he says. Manfredi adds that these missions also shape humanity’s relationship with the universe, predicting that “it will not be long until we can see a human crew roaming” the Red Planet’s surface. “Mars still has many surprises to unveil,” Manfredi says. “In the future, missions – such as Nasa’s next M2020 mission – will aim to bring samples back to Earth that will deepen our knowledge of the interior of the planet. “I believe that the human presence in space will continue to grow in the 21st century and the next century,” says Miguel Alcubierre, a researcher at the Institute of Nuclear Sciences in the UNAM. “And little by little, we will expand through the solar system, perhaps reaching the next 22nd century to the moons of Jupiter and Saturn,” he adds. “Our expansion by the solar system is inevitable in the long term and a natural consequence of our technological development and our curiosity.